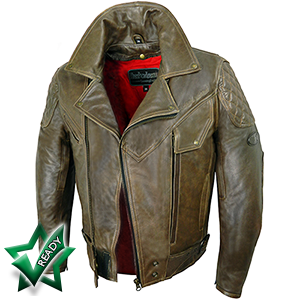 This superb motorcycle jacket is the pinnacle of style, practicality, comfort and safety features. Let us show you. Constructed in 1.2 - 1.3mm antique brown cowhide, this is the ideal leather thickness to offer you optimum protection while still being supple and comfortable to wear. 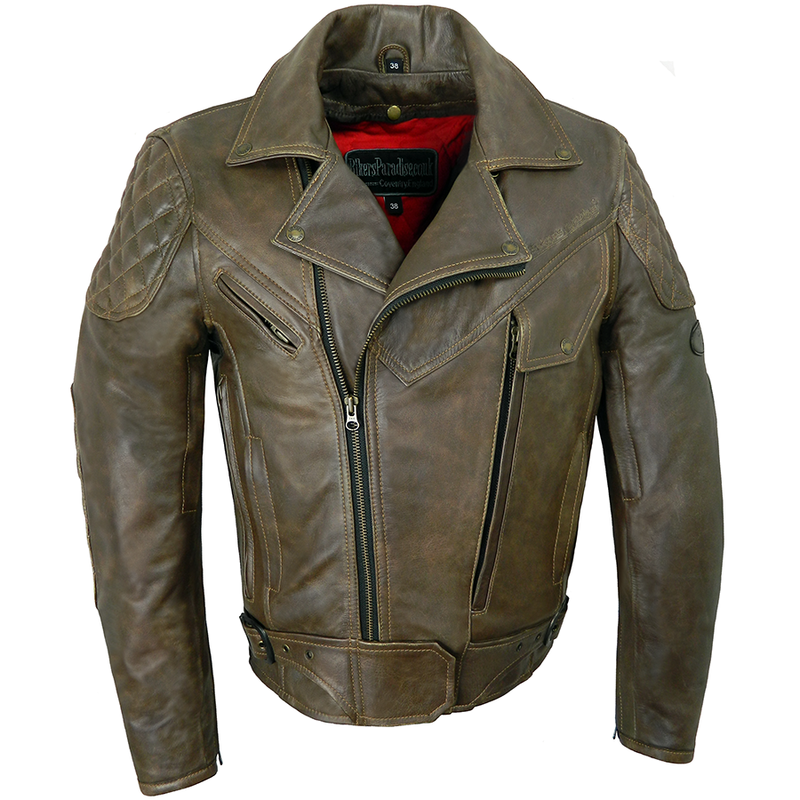 There's little point using the best leather if the construction quality doesn't match. That's why thick nylon-bonded thread is used to stitch this leather bike jacket together. Including extra internal stitching at vulnerable areas. Read more about our construction methods. The next stage in ensuring comfort and the best protection we can provide while incorporating style? The lining. 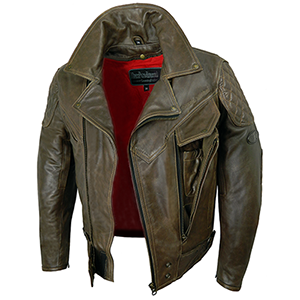 The Rida-Tec Elite leather jacket has a fixed cotton-rich black Airtex lining and a removable quilted red cotton-rich lining. 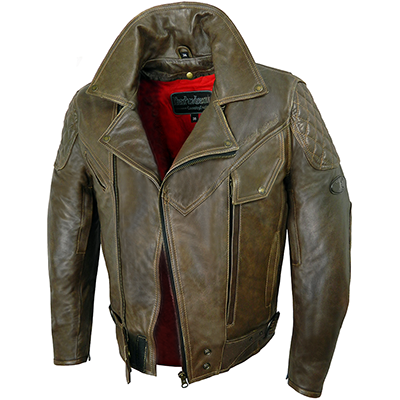 Having cotton next to your skin when riding a motorcycle should be a priority. Unlike man-made lining materials (like nylon, polyester etc), cotton will not melt into your skin if exposed to heat friction from sliding down the road in a crash (possibly resulting in the need for skin grafts). 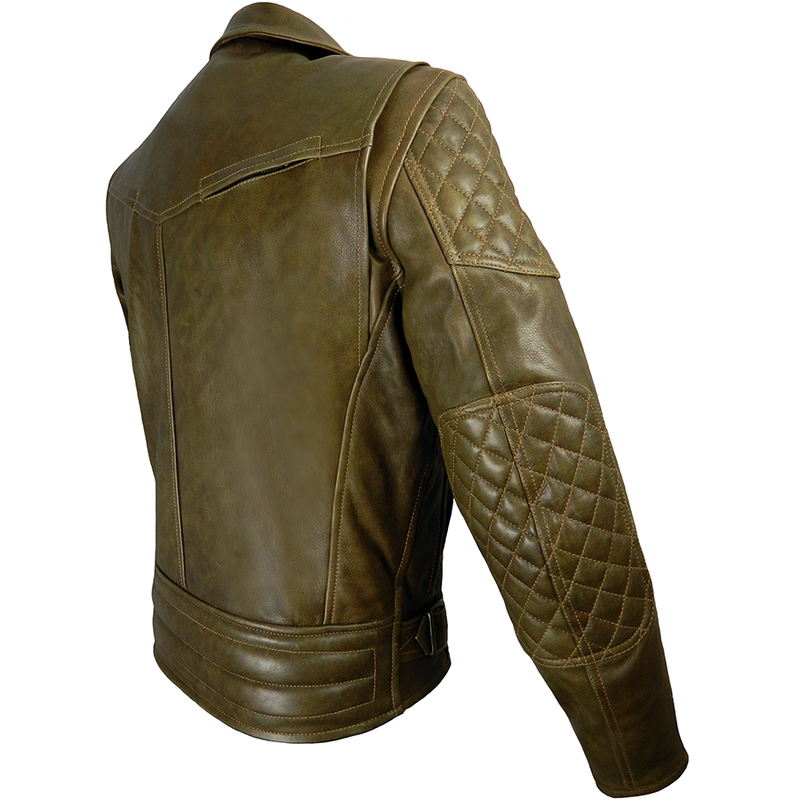 - Quilted leather reinforcement panels on upper arms and elbows. - Front belt and side adjustment straps. 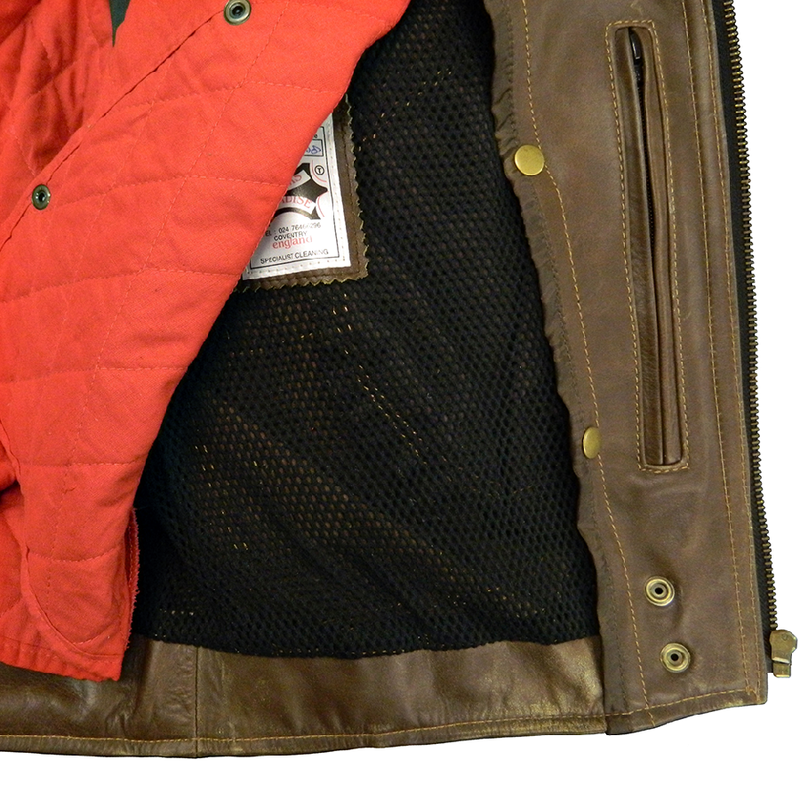 - Chest flap concealing handy pockets. How about practicality and comfort? 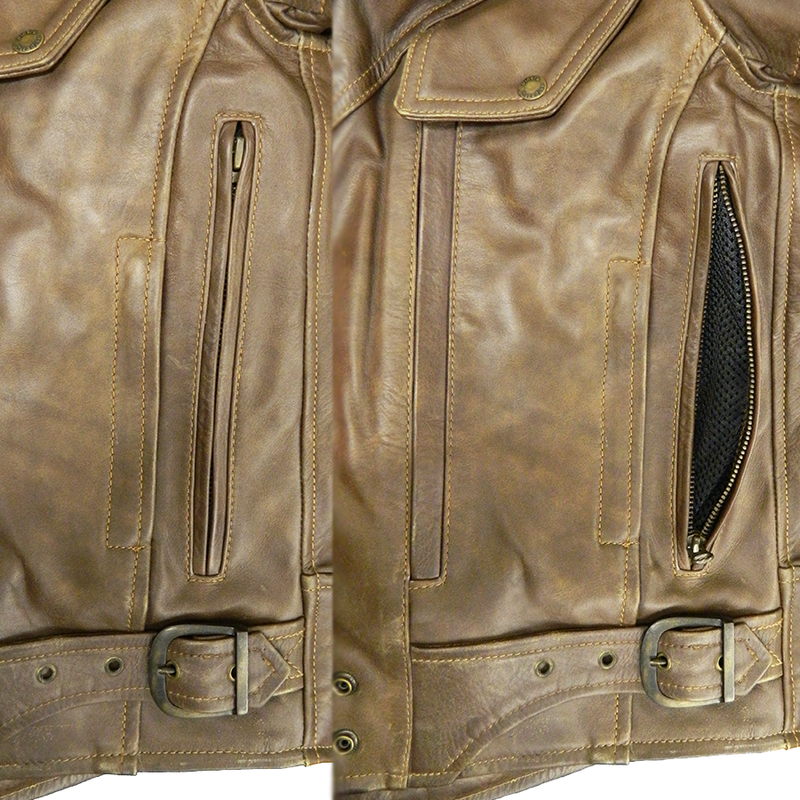 - Heavy duty genuine YKK zips throughout. - Front belt is a press studded and Velcro flap which covers the bottom of the main zip fastening avoiding tank scratching. - One deep inside pocket (zipped). Two outside zipped pockets. 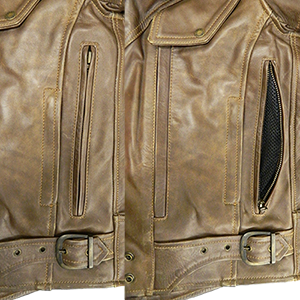 - Chest flap (press stud and concealed zip) that reveals two more hidden pockets - one mobile phone sized and a pen holder. - Zipped cuffs for ease of glove fitting. - Pleated leather back panel across shoulders (at arm holes) for ease of movement and manoeuvring (back photo of jacket shows how discreet this is). 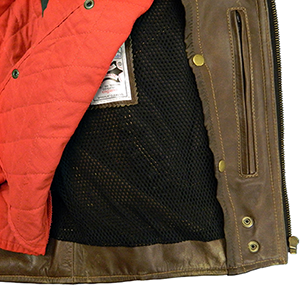 - Concealed zip air vents on back, underside of sleeves, side of torso and chest for air flow during the warm months when the removable lining is removed and the Airtex cotton lining comes into its own. 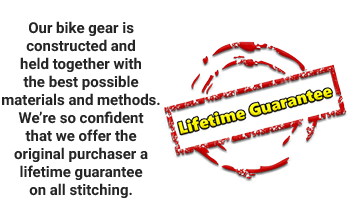 Are you ready for our ultimate safety feature? Our exclusive, unique and fully adjustable Viscotec CE memory armour system. Armour is an optional extra but we can't recommend it enough. Viscotec CE shoulder and elbow memory armour is designed to be comfortable to wear, discreet (almost undetectable in looks) and protect your bones. The dense memory foam absorbs impact which greatly reduces the amount of trauma reaching your bones. Its feathered edging and flexible construction make it easy to wear so why not add that extra layer for peace of mind? 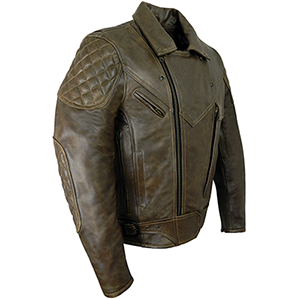 Our fully adjustable system allows you to place the armour in the exact position for you. Be looked after, feel great and take action by arming yourself with one of the most stylish forms of motorcycle riding protection.